BLACKFIRE Total Eclipse Tire Shine Spray 4 oz. Home > BLACKFIRE Total Eclipse Tire Shine Spray 4 oz. Shroud your tires in a dark, rich shine! 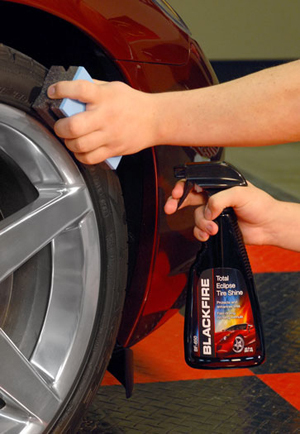 BLACKFIRE Total Eclipse Tire Shine Spray darkens and conditions rubber to restore the look of new tires. This no-sling, water-based tire dressing provides a natural look with one coat or a high gloss finish with two coats. UV inhibitors and polymers protect tires to maintain their color and flexibility. BLACKFIRE Total Eclipse Tire Shine Spray provides the concours look that complements any vehicle. Healthy, new rubber should be dark. That's why Total Eclipse is such a fitting name for our tire protectant. It restores the blackness to tires and helps maintain it with UV inhibitors and ozone blockers. Regular use helps prevent fading and cracking. Tires that have lost their flexibility are more likely to crack. BLACKFIRE Total Eclipse Tire Shine Spray blocks the ozone that speeds up depletion of the rubber's plasticizers. Your tires will stay dark and supple. BLACKFIRE Total Eclipse Tire Shine restores a dark, natural-looking luster to tires. BLACKFIRE Total Eclipse Tire Shine Spray is manufactured using the latest standards in safety and performance. The formula is water-based and solvent-free. Solvents can dry out rubber and silicones can turn brown. We avoided these harmful ingredients and instead used newer, VOC-compliant compounds that offer great looks with none of the drawbacks. BLACKFIRE Total Eclipse Tire Shine Spray dries quickly and does not sling. Our unique formula bonds to the rubber for a lasting satin shine. One coat will create a low-gloss, natural-looking finish. Two coats will yield a high gloss finish. BLACKFIRE Total Eclipse Tire Shine will NOT attract dust like silicone tire dressings. It's water-based! Application is easy. Spray on BLACKFIRE Total Eclipse Tire Shine Spray and wipe off any excess with a tire applicator. Use it on all interior and exterior rubber and vinyl, too! For tires and trim that are as dark as night, use BLACKFIRE Total Eclipse Tire Shine Spray! Feels dry to the touch and does not sling. Apply to clean tires. Spray directly onto surface or tire applicator to avoid overspray. Work into tire and remove any excess with a microfiber towel. If you desire additional gloss, apply a second coat five minutes after first coat.